When it comes to painting using ARIS Express what about an optical illusion like this one, which is neither new nor one of mine. However, every time I look at the 2 squares I am convinced that A and B are filled with a different color. 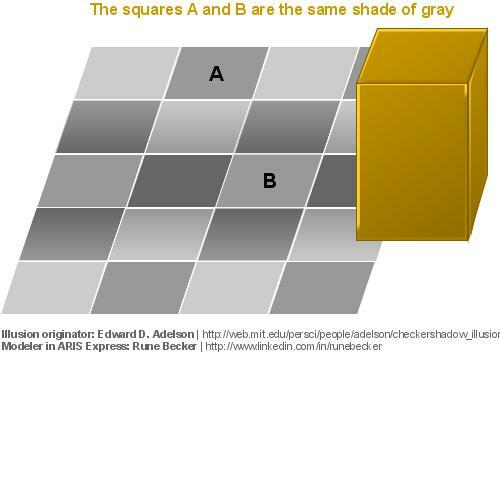 But believe it or not, both squares are in fact of the same shade of gray. Download this model and scroll to the right to see the proof when square A and B are placed next to each other. As the originator of this fine illusion granted to distribute freely his graphic, so you can do with my model. Yes, same color: red=153, green=153, blue=153. It can fool humans, but not me: I'm a cyborg.